Save fuses and money! This handy set of 4 resettable circuit breakers and 2 clip-on test leads allows you to connect a circuit breaker in place of a fuse in your game for use when testing/diagnosing electrical problems. Why waste money on fuses that blow over and over again while you are trying to find the problem in your game? These breakers make testing easy, safe, and inexpensive. Set includes breakers in the most common values of 3, 5, 10, and 20 amps, and two 18-inch test leads with alligator clip ends. Easy push-to-reset operation of breakers allows them to be used over and over again. Clip one end of test leads to the breaker tabs, and the other end to the fuse clips or other testing location in your game, then power up. If a short is present, or too much current is being drawn, breaker will trip with an audible click. Once the problem has been found and repaired, you can re-install standard fuses and resume normal game operation. These are what we use in our shop! We have used these breakers for years in our shop and in our customers homes to diagnose and repair both electro-mechanical (EM) and electronic solid-state (SS) pinball games, old and new. A great addition to your pinball toolbox- you will wonder how you ever did without them! 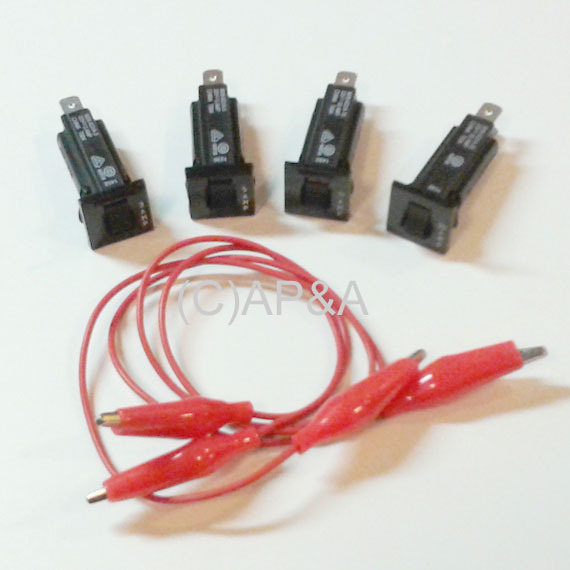 Color of test leads and breakers may vary from those shown in image.